A group for those in mourning will commence at Dorshei Emet Synagogue in Hampstead circa October 15. This group is open to all faith communities. Howard Richler says that dealing with the loss of a loved one in a group context has been helpful after the loss of his wife Ruth. When a group of six to eight has expressed interest a social worker will be engaged. The Ovarian Cancer Canada Walk of Hope takes place Sunday, September 9 at Angrignon Park. The Walk directs all attention and funds to overcoming the most fatal women’s cancer. One out of every two women diagnosed with ovarian cancer isn’t expected to live to see another five years. Unlike other cancers, survival rates for women with this disease haven’t seen significant improvement in 50 years. August 14, the Côte Saint-Luc Men’s Club hosted a musical evening of Broadway songs performed by the talented singers of the West Island Theatre Association (WISTA). 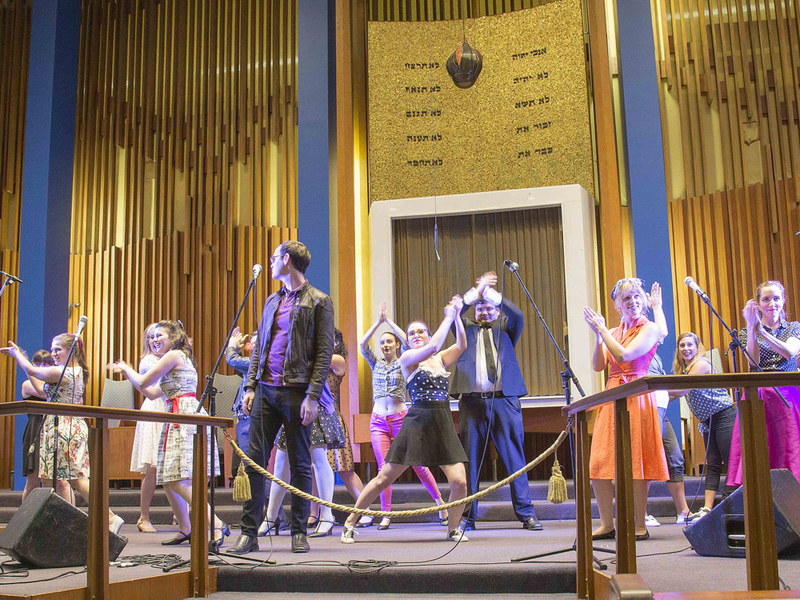 The musical was held at the Shaare Zedek Synagogue with 500 in the audience. Friends found each other and the atmosphere was festive and welcoming. When the show started, toes were tapping and hands were clapping to favourite songs from Fiddler on the Roof, Oklahoma, Jersey Boys, Les Misérables, Grease, The Phantom of the Opera, Sound of Music and Hairspray among others. The show finished with a prolonged standing ovation following the last song, One More Day from Les Miz. The performance was followed by refreshments where people again greeted each other and caught up with friends. designed by Vivianne LaRivière of The Art of Soul Care, is being offered together with ORA Loss & Living Program, a West Island initiative, to develop coping skills for grieving through meditation, creative art and group discussion. surroundings. Participants may register for a series of five Saturday sessions at the Art of Soul Care studio in St. Lazare or a series of eight Tuesday evening sessions at Ste. Geneviève United Church in DDO. The Saturday series begins Sept. 22 from 9am to 5pm. Cost: $250 including 30 hours of workshop time and all art supplies. For more information visit the ORA Loss & Living Facebook page. novel was written in 1944 and published in 1985. The story: In 1944 Nazi-occupied France, young writer Marguerite (Mélanie Thierry) is an active Resistance member with her husband Robert Antelme. When he is deported by the Gestapo, she begins a desperate struggle to get him back. Arts Alive Quebec in collaboration with the Quebec Writers’ Federation and The Association of English-language Publishers of Quebec will hold a free literary and musical event Sept. 8 at Brossard Library at 7855 San Francisco Ave, 1 pm–4 pm. Be the first to comment on "Bits and bobs: More groups and events in Montreal this fall"